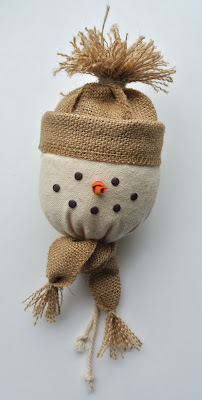 Inch of Creativity: MORE Mr. Snowman! Christmas Decoration! MORE Mr. Snowman! Christmas Decoration! I really hope you're not tired of seeing my Mr. Snowman. Because, as you can see, I have another creation of him to share with you! So, have you figured out what my snowman decoration is made of? Besides his stuffing's and the hot glue gun I used, Mr. Snowman is completely made up of Stampin' Up! product! He is made out of a mini muslin bag, stuffed with cotton batten! His scarf and hat are made out of the 1 1/4" Burlap Ribbon (Have I mentioned that I LOVE THIS STUFF?) and linen thread. His eye's and smile are candy dots and his nose is Pumpkin Pie card stock, sponged with Tangerine Tango Ink, and rolled. Everything was put together with a hot glue gun. No sewing here! I'm pretty happy with how he turned out! I love using things in a different way to be creative. I hope this inspires you to look at things differently and be creative! OH! Don't forget about the current Holiday Sale, going on right NOW! Check it out!